In 1933 the Lions club began sponsoring a community Easter Egg Hunt; Service Learning students continue the tradition. This annual affair is held on the weekend Memorial day is observed. Graduate recognition every year since 1898. Veterans are honored each year at a ceremony at the grade school. Students present a musical program and the veterans share their experiences. On the Sunday after Thanksgiving, Glasco's "Main Street" opens its doors to the community by sharing treats and good cheer as each business and organization displays holiday decorations. Santa visits the Glasco City Library. At 5 p.m., all gather at the community Christmas tree in Water Tower Park for caroling. A community soup supper is held at the school before the Glasco Grade School students’ Winter Concert. Singers from all of the churches of the community present a Christmas Cantata at the Methodist Church. After the performance, there's juice and cookies provided by the churches. You'll feel at home at our community family reunion! 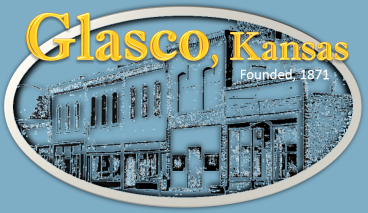 Glasco citizens work together to reinforce a sense of community... building on our heritage. Each year a theme is chosen to highlight history and community attractions.